My God, we'e still not through all this. Here are the various Hendrix tribute bands that I have come across. The acclaimed Swiss tribute band. Noel Redding and Buddy Miles even toured with them. VOODOO CHILD - "Jimy Bleu Does Jimi Hendrix"
Jimy Bleu (that is not a spelling mistake) has been a Hendrix impersonator since the late sixties ! Check out his site to find out more about him, and for audio and video samples of his work. Some excellent interpretations to be discovered there. THE HAMSTERS - "Electric Hamsterland" "The Jimi Hendrix Memorial Concerts 1995"
These guys have a DVD tribute out also (also pictured). This English tribute band really know their Hendrix. They are fronted by Hendrix impersonator John Campbell who is a very capable and convincing guitarist. He stays very close to Jimi's solos but with clever personnal touches here and there (the intro to "Watchtower" for example). Campbell vocals are little deeper than Jimi's but that doesn't deaden the impact of the interpretations. It must be great fun to see them live as they really have got their sound together. The band were featured recently on British TV for a BBC Arena film "Tribute Bands", about The Limelight club in Crewe, England. Many albums exist by this japanese tribute band. 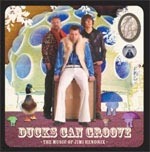 DUCKS CAN GROOVE - "The Music Of Jimi Hendrix"
HENDRIX-ATTACK - "Tribute To Jimi Hendrix"
On the Klone UK label which put out only tribute albums it seems. RAINBOW BRIDGE BAND - "A Tribute To Jimi Hendrix"
THE HENDRIX - "Jimi Hendrix Tribute"
THE LIVE EXPERIENCE BAND - "Tribute To Jimi Hendrix"
THE LIVE EXPERIENCE BAND - "Jimi Hendrix Portrait"
BAND OF GYPSYS - "(A Reunion Concert) - Resurection"
No, this is not Cox & Miles. 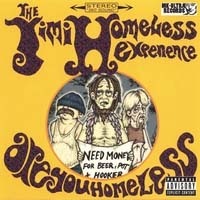 CROSSTOWN TRAFFIC - "Demo Sessions"
STOP - "In The Name Of Jimi Hendrix"
THE HENDRIX FILES - "Phil Bee & Friends"
THE HENDRIX FILES - "Live"
The Jimi Homeless Experience - "Are You Homeless"
Not so much a tribute as parody here using Hendrix as a symbol of the drop-out culture and the problems that arose from it. An "all-star" get together featuring Jim McCarty (Yardbirds) *, Noel Redding, Eddie Phillips (Creation), Ray Phillips (Nashville Teens), Don Crains & Keith Grant (both of Downliners sect). Ooof ! Three pages of Google, that's enough. Many thanks to Christian for his help with these Tribute pages !